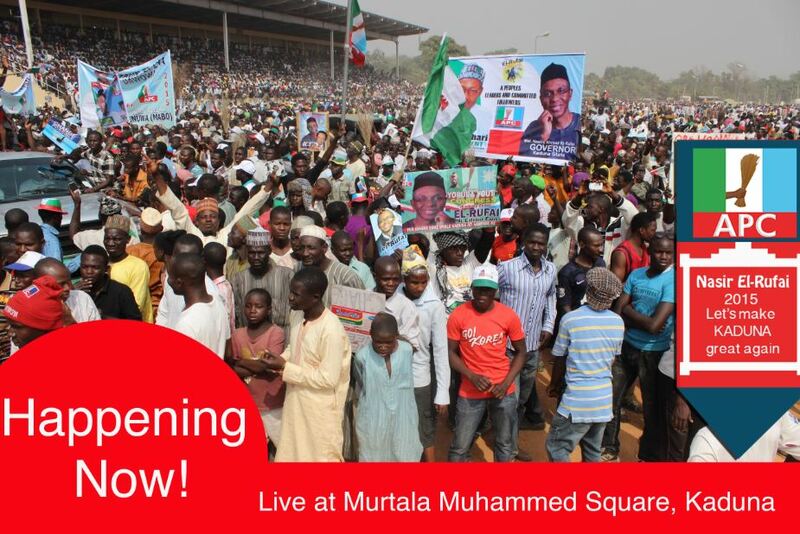 Thousands of recalcitrant youths, who allegedly support the All Peoples Congress (APC) in Kaduna State, yesterday, shut down several major streets in the northern parts of the state capital, in a frenzy of support for the APC Presidential candidate, Muhammadu Buhari, as they awaited his visit. The youths who thronged out as early as 8am from, Tudun Wada, Kawo, Ungwan Rimi, Malali, and other adjoining Kaduna towns believed to be APC strongholds, wielded weapons, and forced motorist and passersby to chant, (sai Buhari, sai El Rufai ) meaning “Buhari and El Rufai only.” Buhari had not even started his rally at Minna, Niger State, where he went to before Kaduna, when the youths started their acts. Vanguard reports that shops were hurriedly closed and parents rushed to schools to bring back their children, with violence seeming to loom. Anyone branding the stickers of the People’s Democratic Party (PDP) or known members, were allegedly molested by the youths. They were also said to have been hurling insults at the Kaduna State governor, Mukhtar Ramalan Yero. A similar occurence rented the air in Lagos State as political thugs clashed at the party’s rally held at Gbagada axis of Lagos. Two persons were reportedly injured. Skirmish started later after the rally had started peacefully. Vanguard learnt that one of the groups, which arrived at the campaign late started the hostility. Policemen were then drafted to the scene to maintain peace as the thugs were driven out of the venue. “Today also, I saw the desperation of the President and his party. On the third mainland bridge, all the president posters and banners have flooded it. In the constitution, the local government has the responsibility to manage advert; that is one of their sources of generating revenue. “And they have been working with Lagos State Signage & Advertisement Agency, LASAA, not only to clean up the state but to put an institutionalized framework for advert management. But the President and his supporters have taken over the advert spot on the road,” he said. That is the spirit of APC- violent by default. Sadly many innocent and naive Nigerians follow them. APC has been consistent in saying dat PDP has ruled Nigeria for 16 disastrous years in which corruption, impunity, insurgency, armed robbery and several ill society held sway. 11. And to cap it all, Obasanjo the Navigator of APC, a man who spent 8years of d disastrous 16years as d maximum ruler of Nigeria. It is now clearer dat APC is a waste basket of PDP, where d people who created n perpetuated d 16 disastrous years are now dumped, so where is d CHANGE coming from? Information or dis information what you reported about Kaduna is far from the truth…supporters of APC waited throughout the day dancing for the arrival of their campaign train. We did not carry our children from schools before closing hours. No supporter of PDP or any party was molested. Please stop being partisan and report facts as it occurs. I passed through Kaduna town on my way to Abuja and saw nothing of such. The report about kaduna may have been paid for, to allow the governor carry on with his threats.